….if you have an interest, you can call in to “The Pat Desmarais Show,” a WXTK 95.1 FM talk radio show, at 12 Noon on Sunday to express your concerns about issues you feel are important to Cape Cod in particular (like revoking the land use regulatory power of the Cape Cod Commission), and Massachusetts in generall (such as ILLEGAL Immigration & Amnesty for Illegals). 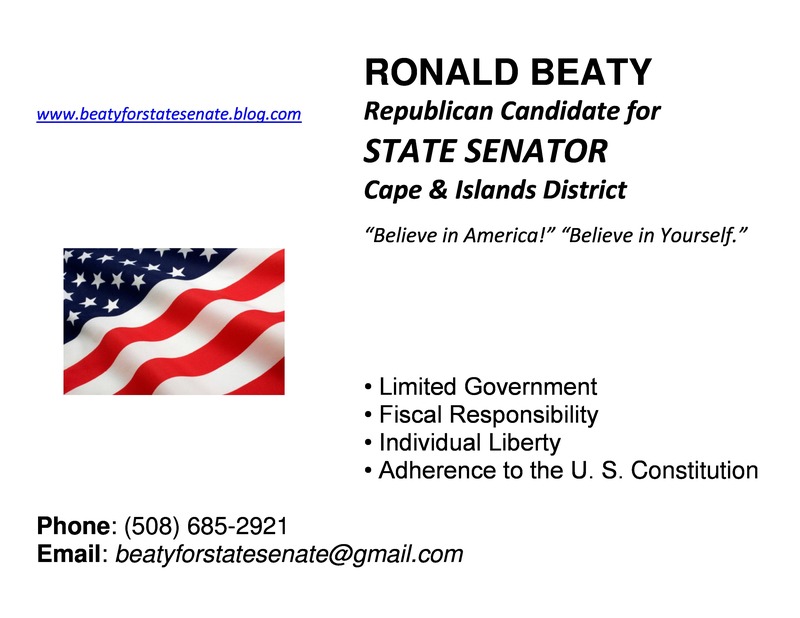 As a Republican Cape & Islands District, State Senate Candidate, I will be a guest on the show at that time as well. The phone number is: 508-775-WXTK (9985). This entry was posted in Barnstable County, Cape and Islands District, Cape Cod Regional Government, Massachusetts, Uncategorized and tagged allen rodney waters, allen waters, amnesty, barnstable county, bureaucracy, cape and islands, cape and islands district, cape cod commission, conservative republican, county government, dan wolf, daniel wolf, election, illegal aliens, illegal immigrants, illegal immigration, land use planning, MA state senate candidate, MA state senator, massachusetts state senate, no amnesty, pat desmarais, patrick desmarais, primary election, radio, radio talk show, republican, republican candidate, republican primary, republican primary election, revoke, ron beaty, ron beaty jr, ronald beaty jr, senate candidate, state senate, state senate dan wolf, state senator daniel wolf, taxpayers, tea party, voters, wxtk, wxtk radio. Bookmark the permalink.